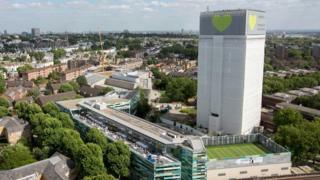 Five people who lost relatives in the Grenfell Tower fire are to sit on a commission to decide the long-term future of the west London site.Survivors of the June 2017 blaze and local residents will also help devise "the most fitting and appropriate way" to memorialise the 72 victims.The panel's 10 representatives will be led by an independent chairperson.Among their tasks will be to decide on the design of any memorial and how the site should be owned and managed.The Ministry of Housing, Communities and Local Government said the Grenfell Tower Memorial Commission has been structured "to ensure the voice of the bereaved carries the most weight". Views of people in the local area will also be sought through a consultation process. What happened at Grenfell TowerGrenfell Tower fire: Who were the victims? The government says the purpose of the community panel is to decide "what happens to the Grenfell Tower site in the future, assumed to be a fitting memorial to remember those who lost their lives". Adel Chaoui from survivor's group Grenfell United said: "Creating a fitting memorial on the Grenfell tower site is a momentous task".He said the panel would need to remember the "lives lost, ensure what happened is never forgotten and be something this community can hold in their hearts for generations to come".The announcement on who would be included came as it was revealed that more than 1,200 people affected by the Grenfell Tower fire received mental health treatment in the year following the fire.Central and North West London NHS Trust said a total of 1,108 people had therapy for trauma-related conditions or complex grief, while another 126 people with long-term mental health problems reported worsened condition.The "vast majority" of patients are still receiving help, while a further 200 people with complex psychological and social issues are receiving support ahead of therapy.Meanwhile, at the Grenfell Tower public inquiry, a fire commander became emotional as he recalled the dedication of the rescue crews on the night.Patrick Goldbourne, who helped marshal missions up the block explained that, from experience of other blazes, firefighters often find people shutting themselves away in small spaces to escape the flames - so rescue crews cannot overlook any possibility. He said: "Crews rescue people in fridges, cupboards, all kinds of places they find survivable. We would not stop until we searched every single room, every single cupboard, every single door, until we're satisfied we've got everybody. "He paused for several moments and wiped a tear from his eye before adding: "It's painful we lost 72 people that evening but we were never going to give up on them."